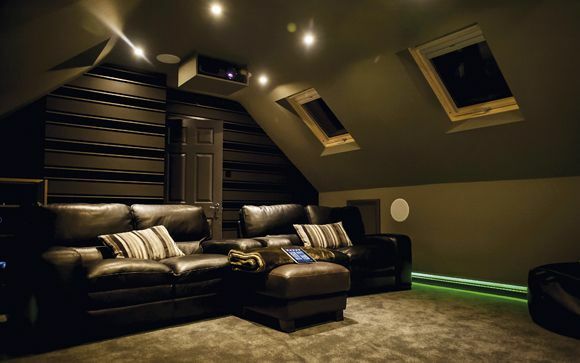 The owner of this cinema room has an extra reason to love it – last year it was crowned Best Home Cinema in the £40,000-£100,000 category in the CEDIA Awards. Completed by London/south coast-based pro outfit Pyramid AV, it features native 4K projection and a state-of-the-art Dolby Atmos speaker configuration. It’s the first dedicated home cinema room that Vince, its owner, has had: 'Like many others, we’ve had others rooms with AV kit installed – but nothing on this scale.' It's part of a self-build property, where the space for a cinema was one of the first areas to be created. The room has six seats spread over two tiers, with each one getting uninhibited line of sight to its centre-piece – a 130in, 2.37:1 projector screen that acts as the canvas for a Sony VPL-VW520ES 4K projector. It's a largescale theatre then, and has the audio to match. A 9.1.6-channel Dolby Atmos Artcoustic array, fed by high-end Trinnov processing and established with guidance from Dolby in the US due to the cinema's angled ceilings, handles soundmixes from the associated 4K BD, Sky Q, Apple and Amazon sources. Power comes from Rotel amplifiers. Vince wasted little time in putting his new room to the test with some choice demo favourites. 'Pacific Rim was one of the first we sat and watched. It’s FX-heavy – visually and sonically – and delivered a seat-shaking experience. Sci-fi makes up a large part of Vince's viewing – he ranks Oblivion, Interstellar, Inception, Gravity and Everest as his five film favourites. 'Oblivion in 4K looks and sounds incredible,' he tells us.